Beginning with a 7.2 quake on Wednesday, March 09, 2011 at 11:45:20 AM at epicenter, there were 21 quakes registering over 5.0 leading up to the big one. All were very near where the big one was to take place…. Then, for almost thirteen hours, there were none… Preasure was building…. and building, … and building….. Since the big one, up to this posting, there have been 240 more over 5.0…..
I’m Turning Japanese….za…. I Really Think So…. The tragedy is sad, and as the death toll rises it will get sadder….. But my original takeaway was that very little damage occurred… Considering this was the worlds largest earthquake near a modern nation, the damages were less than anticipated. Why? Intelligent people came up with intelligent solutions. Call it the superiority of science over religion…. We still have a nuclear situation that may grow out of hand, and we still have to pull a lot of money out of the globe and funnel it back to Japan, but overall, watching the videos of the quake, I was impressed by how little damage actually occurred. This was the 5th recorded largest in the world! Total damage: two bottles of red wine? The tsunami was a different matter. Those images shook me up. I remember after seeing them while listening to Rick Jensen discuss the Wisconsin Walker fiasco. That radio discussion suddenly seemed so little and petty, after watching cars, then boats, then ocean liners flow down city streets. What scared me most, after seeing Sumatra’s video’s 7 years ago which I thought I could survive, was the flow of what looked like nothing less than a garbage pile, marching unchallenged over fields and into towns, taking them with it. 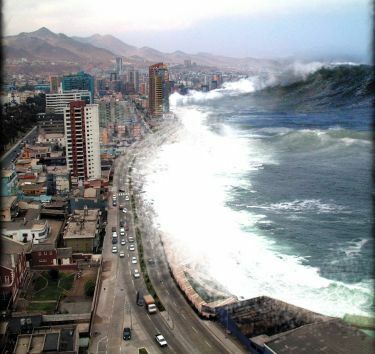 How does one survive that, I wondered?…..
Obviously, for a tsunami’s in a urban area, the answer is to build shelters that are tall. A tall concrete tower with a rounded concrete surfaces to lessen the impact from large floating objects, is obviously the best solution. The water flows in, around, and back out to see.. Multiple of these around a coastal city with sufficient warning, could drastically cut down causalities in urban areas closer to zero…. Secondly, I noticed that unlike American homes, most interiors appearing in the Japanese videos showed little furniture. Instead, utility shelves, like the ones seen in store stockrooms and warehouses, seemed to adorn all the homes shown, with computer screens, terminals, cameras and other electronic devices taking center stage. It was as if you went home to a computer screen, that is all you needed.Also I noticed all their cars and trucks looked new. As if all their personal income was spent on electronics, cars, and real estate. It seems the Japanese learned much from the Kobe quake of 95. I was relieved to see that the damage was mitigated by good engineering..
It’s a lesson we should bring to this nation, if and when we get smart and stop electing Republicans…..
First Algeria, then Tunisia, Yemen, Jordan, Egypt, and Albania. And I just heard Kyrgyzstan had riots too? So then, who is blame? A better question,…. once facts are on the table, is WHAT… is to blame? The heart of the problem is in the dysfunctional nature of conservative, traditionalist Arab society. They fail to function economically, because of their values prohibit them from doing so. That is not a Muslim view (the practice is rare in Turkey, Iraq, Iran and Pakistan), but an Egyptian Muslim view. In the most fundamental of matters, President and Mrs Mubarak are incomparably more enlightened than the Egyptian public. Three-quarters of acts of genital mutilation in Egypt are executed by physicians, meaning they are not being performed at religious ceremonies, but are instead being quietly paid by the very parents of the girls themselves. Fact is, Egypt is wallowing in backwardness, not because the Mubarak regime has suppressed the creative energies of the people, but because the people themselves cling to the most oppressive practices of traditional society. And countries can only languish in backwardness so long before some event makes their position untenable. So what broke the back of those toiling in Egypt? The price of wheat? Wheat prices have almost doubled in the past year. Egypt is the world’s largest wheat importer, beholden to foreign providers for nearly half its total food consumption. Half of Egyptians live on less than $2 a day. Food comprises almost half the country’s consumer price index, and much more than half of spending for the poorer half of the country. Egyptians love their bread. The nation is the world’s biggest consumer of bread with around 400 grams of bread consumption a day, easily eclipsing France at just 130 grams daily. So, why can’t the Egyptians buy wheat? The prosperous Asians are buying it up first. The wheat flows to the area having the most money. Earlier this year, after drought prompted Russia to ban wheat exports, Egypt’s agriculture minister pledged to raise food production over the next ten years to 75% of consumption, against only 56% in 2009. Local yields are only 18 bushels per acre, compared to 30 to 60 for non-irrigated wheat in the United States, and up 100 bushels for irrigated land. Prosperous Asians want their protein. And we all know it takes seven times as much wheat to make an equal amount of protein. The Asians have priced wheat out of the Arabs budget. The trouble isn’t long-term food price inflation: wheat has long been one of the world’s bargains. The International Monetary Fund’s global consumer price index quadrupled in between 1980 and 2010, while the price of wheat, even after the price spike of 2010, only doubled in price. What hurts the poorest countries, though, isn’t the long-term price trend, though, but the volatility. It turns out that China, not the United States or Israel, presents an existential threat to the Arab world, and through no fault of its own: rising incomes have gentrified the Asian diet, and – more importantly – insulated Asian budgets from food price fluctuations. Economists call this “price elasticity.” Americans, for example, will buy the same amount of milk even if the price doubles, although they will stop buying fast food if hamburger prices double. Asians now are wealthy enough to buy all the grain they want. If wheat output falls, for example, due to drought in Russia and Argentina, prices rise until demand falls. The difference today is that Asian demand for grain will not fall, because Asians are richer than they used to be. Someone has to consume less, and it will be the people at the bottom of the economic ladder, in this case the poorer Arabs. Wheat supply dropped by only 2.4% between 2009 and 2010 – and the wheat price doubled. That’s because affluent Asians don’t care what they pay for grain. Prices depend on what the last (or “marginal”) purchaser is willing to pay for an item…. It wasn’t the financial crisis that undermined dysfunctional Arab states, but Asian prosperity. The Arab poor have been priced out of world markets. There is no solution to Egypt’s problems within the horizon of popular expectations. Whether this regime survives or a new one replaces it, the outcome will continue to be a disaster. So in each of these conservative Muslim states, no matter who remains or takes over, the conditions will not become better until they understand that… it is their conservatism, that is literally the thing killing them.